Bus from Johor Bahru to Muadzam Shah is one of the important bus service especially for students who study in the university or polytechnic in Muadzam Shah. Muadzam Shah is known as a town with fully established quality higher academic institutions. Therefore, there are many students rely on this bus service to travel back and forth between Johor Bahru and Muadzam Shah. Cepat Express is the only bus operator offers bus from Johor Bahru to Muadzam Shah. Cepat Express is a reputable express bus company in Malaysia by providing excellent quality and reliable bus service. The bus schedule from Johor Bahru to Muadzam Shah is very limited with only up to 2 daily departures. The first bus operating in the morning at 10:30am. The following bus schedules are in the noon 12:30pm. Please note that there is no bus schedule from Johor Bahru to Muadzam Shah at night. The travel time required from Johor Bahru to Muadzam Shah is approximately about 4 hours depending on the road traffic condition. Please note that all the buses in Malaysia have no toilet on board. Therefore, at least one washroom break will be given during the journey. The bus fare from Johor Bahru to Muadzam Shah is reasonably charges at RM 24.00 for adult and RM 18.00 for child. The bus driver will pick up all the passengers at Larkin Bus Terminal. Larkin Bus Terminal is the largest bus terminal in Johor Bahru which can be easily access via city bus or taxi. Upon reaching Muadzam Shah, the bus service will terminate at Muadzam Shah Bus Terminal. 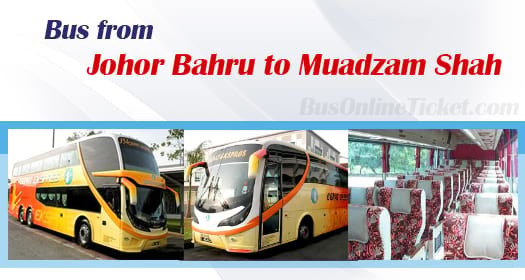 Book your bus ticket from Johor Bahru to Muadzam Shah with BusOnlineTicket.com would be your best choice to book your bus ticket online. BusOnlineTicket.com is a one-stop online booking portal for bus, train and ferry tickets feature a large number of operators in Singapore and Malaysia. You are advised to book you ticket online in advance to have a piece of mind that your seat is secured.